Hi everyone and welcome, today the Art with Heart Team girls are showing you their favourite Bundles from the 2017 Stampin'Up Catalogue. 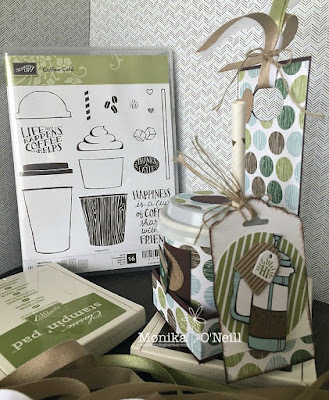 Bundles make creating a breeze, because of the perfect coordination. It's a bonus that you get 10% off by bundling the products together. There are 24 Bundles in the new catalogue so ask us about them, or for a catalogue today!!! You have come from the lovely Sharon Davern Blog Hops are full circles, so you can start hopping here and then at the end of each post is a link to the next one. There is also a list of participants at the end in case of any broken lines. Now let's get started! 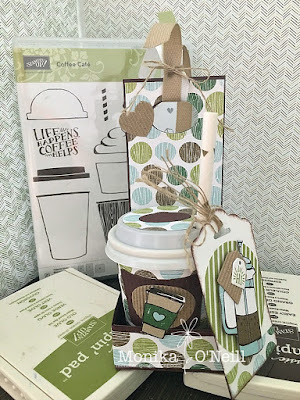 The bundle I chose today is the Coffee Cafe Bundle, when I first saw it I knew it would be the first on my list to get, anyone who knows me knows I love a good coffee, so much potential with this set just love it. 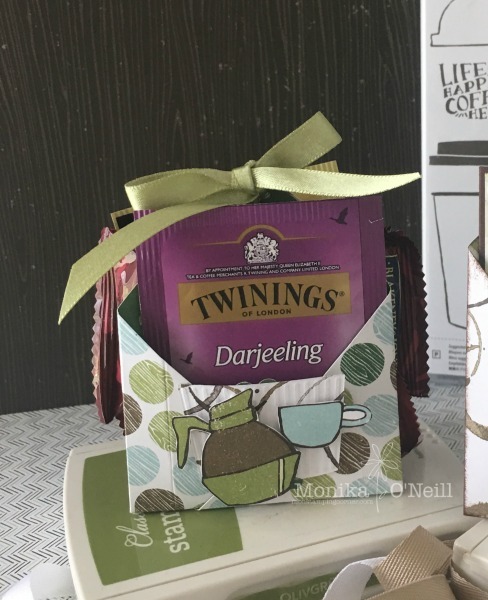 I chose to make two tea bag holders in 2 different sizes, one for coffee and one for tea and a decorated coffee cup with holder, these make great gifts for market stalls or a little gift for someone just because. 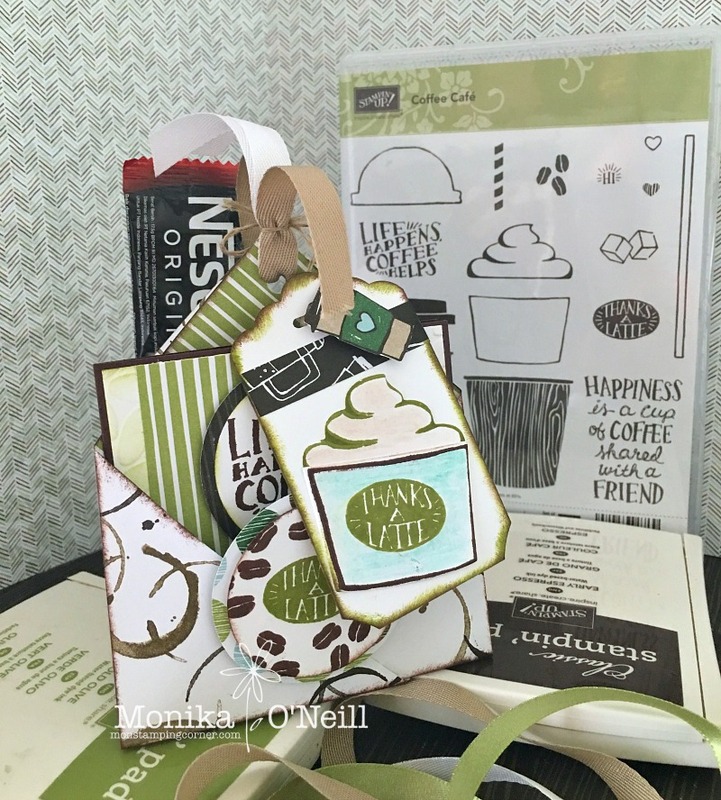 I will start with my larger size coffee bag holder I used the Coffee Break DSP and cut it to 8 x 8 instead of the usual 6 x 6, these are fairly straight forward and lots of tutorials around but if you would like my instructions let me know and I will be happy to share them. I also made a small thank you card to go with this. For the sentiments I used the 2" and 1 3/4" inch punches. I only used 2 ink colours for all the projects Early Expresso and Old Olive. The Ribbon colours are Crumb Cake and Whisper white and I used Linen Thread to tie at the base and made a small bow. On the thank you card I used Early Expresso Card Stock, the Whisper White mat I ran through the big shot using the Petal Burst folder (reminded me of coffee beans) and sponged over it lightly with Old Olive, I used the Shimmer Ribbon Pear Pizzazz, again used the 2" & 1 3/4" circle punch, I attached a little set of tags on the side using the little oval thinlet, tiny tag and stamped Hi and coffee beans, the heart is from the Corrugated Elements. 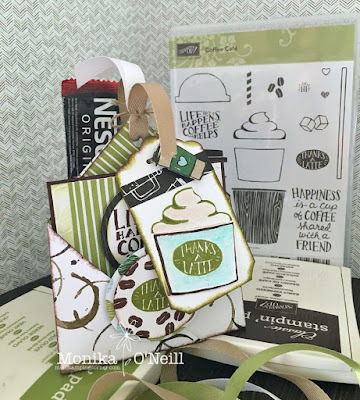 On one side I put in 2 small choc chip biscuits, a small nescafe coffee sachet and a mini old gold chocolate and on the other side the thank you card which measures 3 1/2 x 3 1/2. For my next project it is the standard 6 x 6 tea bag holder. Again using a sheet of Coffee Break DSP. On each side I used the corrugated thinlet on some DSP and attached one to each side ( a bit hard to see because of the colour) then I fussy cut the cups and pot. On the top I tied Shimmer Ribbon Pear Pizzazz too tie a bow. With this one I put in a tea bag on each side and in the middle I put a small pkt of biscuits and a mini old gold chocolate, if you wanted to you could also make a mini thank you or for you card. My third project is mini coffee cup and holder, I really like these and are fun to make. Again lots of tutorials around to make the holder but I am happy to share instructions if you would like them. I was able to purchase the 4oz coffee cups with lids from an Australian supplier I have always loved these and happy I found it, again great to make for markets or to hold a gift card just add a belly band around the back to hold it in place. Inside the cup I put some clear shredding and a mini M&M's, a bit of a novelty gift. I found the easiest way to get a template to cover your cup is to cut a cup up, I know it may be wasteful but this way you get the perfect template. 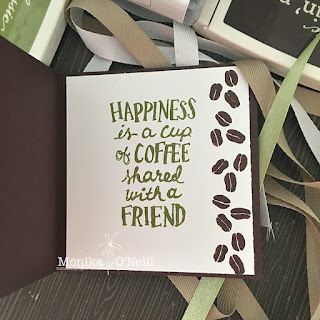 I used tombow to adhere the Coffee Break DSP gives you a bit of wriggle room. On the lid I punched out the same paper as the cup from the 1 3/4" punch and just cut out an oval from Early Expresso just to break it up a bit, the straw is cut in half, and attached the tag with Linen Thread, I also used some of the Corrugated Elements. On the top I tied Crumb Cake, Whisper White and Shimmer Ribbon Pear Pizzazz and again used Linen Thread to tie together. So any questions feel free to ask. If you would like a catalogue email me and I will send one out to you. 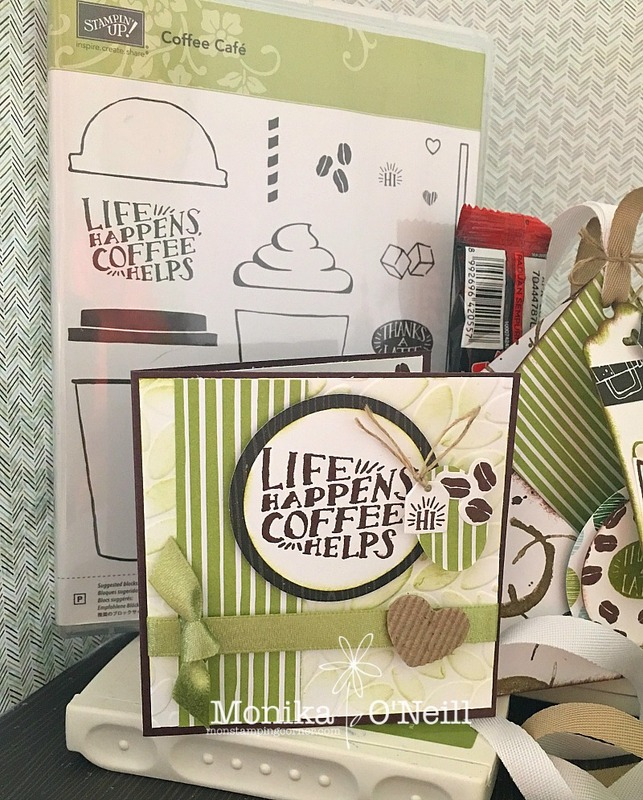 Happy Crafting and hope you have a wonderful day. To hop over to Ros Davidson just click on the link below. These are very cool! I'm not a coffee drinker, but I do love the DSP. You've put together a great range here, I'm impressed! 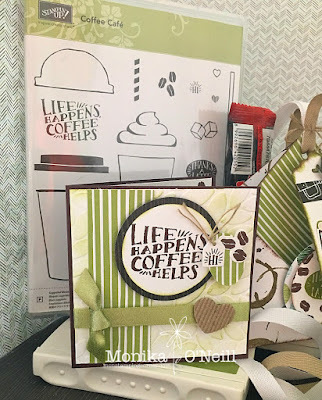 Oh I love these Mon, and I don't drink coffee but I do drink tea so thanks for thinking of me! I know, just me LOL! Gorgeous projects, Monika. I love, love, love this paper, and you've showcased it beautifully. Great use of this bundle Mon! 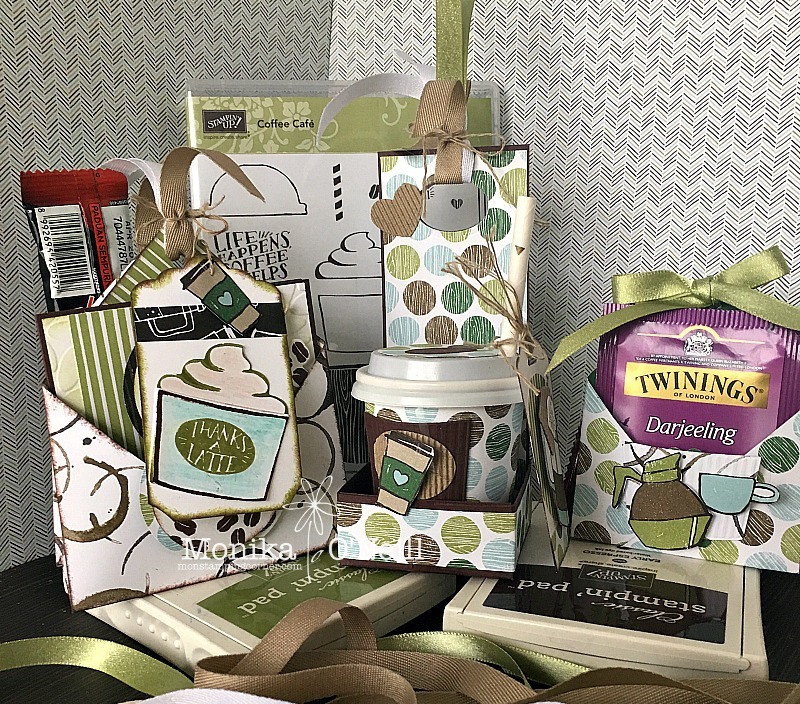 You have even created projects for the tea drinkers, very clever and creative. Wow, what an awesome set of projects you've made. So creative.